Gareth Bale has returned to full training with Real Madrid to provide a boost to under-pressure coach Julen Lopetegui. Bale was replaced towards the end of a 1-0 LaLiga loss away to Deportivo Alaves in Madrid's last match before the international break. That defeat extended Madrid's run without a goal to four matches in all competitions, the longest they have gone without scoring since 1985. 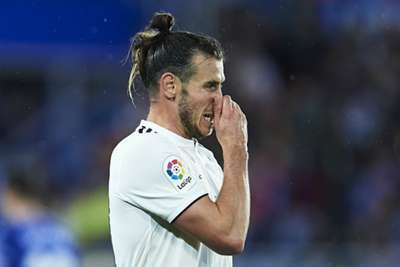 Bale, who had muscle fatigue according to Ryan Giggs, did not feature for Wales during the international break but he was in full training with Madrid on Thursday. The 29-year-old looked sharp in a clip posted on Madrid's Twitter account, racing onto a pass and rounding goalkeeper Thibaut Courtois before finishing well. Bale and Madrid are in action at home to Levante on Saturday before taking on Viktoria Plzen in the Champions League three days later.